This warning may deter some car thefts, but you should take other steps as well. Image from Flickr. Vehicle theft rates have been dropping, by as much as 18 percent over the last two years. At the same time, vehicle thefts do still happen. It is important to take a few steps to reduce the chance your car will be stolen as much as possible. When you leave your car running, even with the doors locked, you are inviting thieves. Even if your stop at the ATM or coffee shop will be only a few minutes, turn off your car. Use remote-start systems to warm up your heater or get your air conditioning going only if your vehicle is safely locked behind a private fence. In some states, leaving your car running unattended could be illegal. No matter what, lock the doors to your vehicle. It only takes a few seconds, and over half of all stolen cars are unlocked. Even if you don’t lock the doors, take your keys with you. When you’re parking, choose a well-lit parking lot, preferably with cameras or an attendant. Though keeping your registration with you while you are in the vehicle is important, you should never keep it with the title. If your car is stolen, the title can be used to sell the car much more easily. If you will be leaving your car parked for a week or more, disable the car. Unhook the battery or remove the ignition fuse. This will help keep your battery charged, and will make it more difficult to steal your car. Make sure any items of value are hidden. 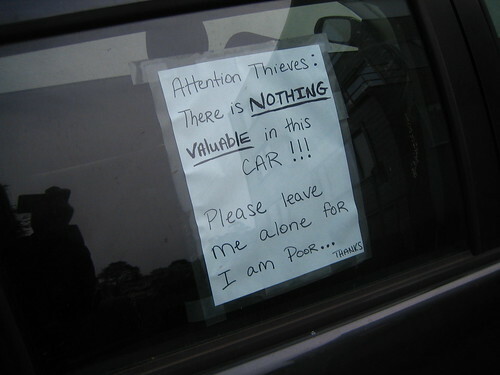 Either in the trunk, under a covered back or with you – never leave anything that is valuable in plain sight. Even during hot summers, when it is tempting to leave your windows open, don’t. Leaving your windows open makes it easier for thieves to gain access to your vehicle. I made the mistake of leaving valuables right out in the open for passersby to see. Woke up the next morning to a busted passenger window and everything I had in there worth money… gone. So yeah, keep your stuff tucked at all times. You don't want to learn it the hard way.